Basinger, James. "Fossil Plants". The Canadian Encyclopedia, 28 May 2018, Historica Canada. https://www.thecanadianencyclopedia.ca/en/article/fossil-plants. Accessed 20 April 2019. "Plant" refers to familiar land plants, and also to aquatic plants, mosses, liverworts and algae plants. Although not technically plants, fungi and bacteria are often included. Palaeobotany is the study of ancient plant life using fossil evidence. Plant fossils are found coast-to-coast in Canada, from 45-million-year-old mosses in British Columbia to fossil forests on Axel Heiberg and Ellesmere islands in the Canadian Arctic. Two species of fossil plants, Archaeopteris obtuse (left) and Archaeopteris halliana (right) (courtesy parc national de Miguasha \u0096 SÉPAQ). Site of the ancient forest, Axel Heiberg Island (photo courtesy David Grattan). 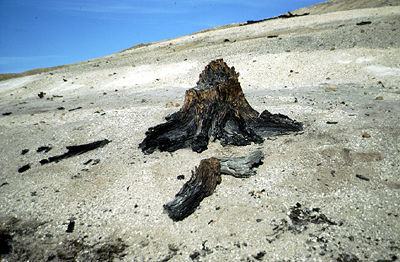 Fossil tree on Axel Heiberg Island, some 40 million years old (photo courtesy David Grattan). The first organisms to evolve on Earth resembled bacteria. They consumed organic molecules from which they themselves originated, as well as molecules formed by the combination of carbon dioxide, water and nitrogen, accumulating since oceans first formed. Essential to their success was the evolution of plants — organisms capable of manufacturing their food using sunlight and inorganic molecules. The simplest living photosynthesizers are cyanobacteria, which now live in nearly every environment and, in some aquatic habitats, produce stromatolites — mounds composed of layers of sediment. The earliest signs of life are 3 to 3.5-billion-year-old stromatolites of western Australia, South Africa and the Canadian Shield. On the shores of Lake Superior, near Kakabeka Falls, stromatolites and the microscopic organisms that grew on them 1.9 billion years ago have been preserved in silica (a hard mineral substance). These organisms compare closely with living cyanobacteria. Their description, by E. S. Barghoorn and S. A. Tyler in 1965, startled geologists and biologists. Although the presence of life on the early Earth had been hypothesized, proof of its existence had been lacking. These fossils, the first indisputable evidence that life existed so long ago, initiated investigation of Precambrian fossils (that is, from before 542 million year ago) around the world. Throughout most of the Precambrian eons (the Archean and Proterozoic), Earth was dominated by cyanobacteria and bacteria. As the cyanobacteria released free oxygen (O2) the chemistry of the global environment was changed from anoxic (without free oxygen), suitable only for anaerobic microbes, to oxic, in which aerobic (oxygen-requiring) organisms could thrive. All familiar plants and animals, including humans, are aerobic, and depend on free oxygen for metabolism. Transition from anoxic to oxic conditions during the Precambrian eons made possible the evolution of complex plants and animals about one billion years ago. Evolution then proceeded, fueled by aerobic metabolism, at a great and seemingly ever-increasing rate. Survival of such ancient organisms as cyanobacteria is due to their remarkable adaptability in an ever-changing world, and to the ever-present place in the environment for such small and simple life forms. The fossil record of higher algae is poor, except for lime-secreting red algae and green algae. Since the Cambrian period, these algae have been important in the construction and cementation of reefs — many such reefs forming natural reservoirs for some of Canada's oil. Invasion of land by plants from an aquatic environment occurred late in the Silurian period (about 444–419 million years ago). Water, of prime importance to living things, is easily available to aquatic organisms, but ancestors of land plants had to develop water-conserving features for survival out of water: cuticle, a waterproof waxy coating; roots or other underground organs for absorbing water; a conducting system for water transport; and watertight reproductive bodies. With life possible on land, a vast, new habitat was available to any algal group overcoming the water barrier. Many must have tried, but only two succeeded, both evolving from green algae: bryophytes (mosses and liverworts) and vascular plants (with internal woody tissue for support and water movement). Bryophytes, bound to a lifestyle and structure that keep them small, are usually fragile and seldom occur as fossils. Mosses and liverworts first appear in rocks of the Devonian period (about 419–359 million years ago). Fossil mosses dating back 45 million years from British Columbia are very similar to living mosses, suggesting that many species of bryophytes are ancient and evolve very slowly. Since the initial colonization of land in the Silurian, no new groups of land plants have evolved from algae. Competition with pre-existing, increasingly well-adapted groups became too severe. Vascular plants have been the dominant land vegetation for over 400 million years and have been continually evolving in response to climatic and environmental change. The earliest vascular plants, the rhyniophytes, were small, naked, simply branched, without roots or leaves. They gave rise to two groups that flourished in the early Devonian (about 419–393 million years ago): zosterophylls, usually covered by soft spines, and trimerophytes, tending to complex branching and a shrubby habit. Well-preserved fossils of these early Devonian groups are found at famous fossil plant localities at Gaspé, Québec; Chaleur Bay, New Brunswick; and the Abitibi River near James Bay, Ontario. These fossils provide much information about plant structure and evolution. J. W. Dawson examined them and recognized their significance. His discovery of these strange, leafless plants was largely ignored: none believed such a world existed. Dawson persevered, however, and is now recognized as the founder of Devonian palaeobotany. Several new groups of land plants evolved in the middle (about 393–383 million years ago) to late (383–359 million years ago) Devonian. Zosterophylls gave rise to a once-diverse group of plants that bore leaves that evolved from enlarged spines: clubmosses and their relatives, including giant "scale trees" (Lepidodendrales). The trimerophytes, on the other hand, gave rise to a far greater number of descendant groups, all deriving leaves from modified branching systems: horsetails with leaves forming a circle around the stem; ferns with compound leaves; and progymnosperms — woody, free-sporing ancestors to seed plants. Progymnosperms developed thick, woody stems and formed the first extensive forests, found preserved in late Devonian rocks at Escuminac Bay and Gaspé, Québec; the Ghost River area of Alberta; Hess Mountains, Yukon; and Ellesmere Island, Northwest Territories. The early Carboniferous Period differed markedly from the Devonian, as rising sea levels flooded most of the continent. 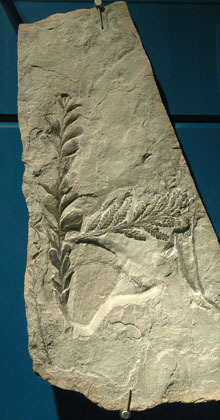 Few fossil plants are known from this time in Canada. As sea levels fell in the late Carboniferous, great swamps developed on old seafloors. The Sydney and Pictou coalfields in Nova Scotia and Minto coalfield in New Brunswick are legacies of these coal-age swamps. Late Carboniferous fossils from these coalfields, extensively studied by W. A. Bell, reveal a strange world of scale trees (giant clubmosses more than 30 m tall) and calamites (giant horsetails 20 m tall). Calamite twigs, with star-shaped leaves circling the trunk, were abundant during this time and are easily recognized. Cordaites, extinct relatives of conifers, were the only tough, woody plants of the swamps. Ferns and seed ferns, though unrelated, produced similar types of fernlike foliage. Although the Carboniferous period (359–299 million years ago) is often called the "age of ferns," many types of fernlike leaves actually bore seeds, and therefore only superficially resembled ferns. Plants that grew in dry uplands of the Carboniferous were rarely fossilized. True conifers, hardy ferns, cycads, and seed ferns were evolving in these dry areas. The Permian (about 299–252 million years ago) and Triassic (about 252–201 million years ago) periods brought further lowering of ocean levels, glaciation in the southern hemisphere, and desert conditions in much of North America. Carboniferous swamp plants became extinct and plants adapted to dry conditions flourished. The age of conifers and cycads continued for over 100 million years, paralleling the age of dinosaurs. Triassic forests of conifers, cycads and cycadeoids (seed fern descendants with stubby trunks and stiff, feather-shaped, compound leaves), ferns and seed ferns are preserved in the coal-bearing rocks of Axel Heiberg and Ellesmere islands. When ocean levels rose and moisture increased during the Jurassic (about 201–145 million years ago) and Cretaceous (145–66 million years ago) periods, these plants spread to available habitats. Many early Cretaceous fossils are found in British Columbia and western Alberta coalfields (Dawson Creek, Canmore, Luscar and Grande Cache). In the early Cretaceous (145–101 million years ago), seed ferns became extinct but, before doing so, gave rise to angiosperms, the flowering plants. The early angiosperms developed advantages over contemporary groups (e.g., rapid reproductive cycle), which made them highly efficient plants, well adapted to "weedy" growth. These modifications, including flowers for attraction of insect pollinators, proved advantageous in many habitats. Interaction between plant and pollinator has been a driving force behind the astounding diversification of both flowering plants and insects. Some of the earliest-known flowering plants are found in northeastern British Columbia coalfields. Late Cretaceous (about 101–66 million years ago) floras of the Dawson Creek area of British Columbia, and Milk River, Alberta, reveal increasing dominance by angiosperms. These fossils, while generally resembling some living angiosperms, represent old, extinct families, and their relationships to living groups remain unclear. At the end of the Cretaceous, the climate cooled, inland seas covering much of western Canada drained, and dinosaurs became extinct. At the boundary between the Cretaceous and Paleogene is evidence of extinction among land plants, too. During this interval of mass extinction, Earth was struck by a massive meteorite. Fallout from this impact is preserved in boundary sediments in southern Saskatchewan as a pale clay, rich in rare earth elements such as iridium. In the early Paleogene period (66–56 million years ago), Earth entered the age of mammals. Paralleling the rise of mammals is the rise of "modern" flora, which consists overwhelmingly of flowering plants. 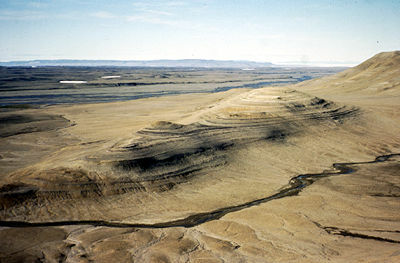 Early Paleogene fossils are found over much of Alberta (e.g., Red Deer River, Lake Wabamun coalfields and Robb to Coal Valley coalfields) and southern Saskatchewan (e.g., Eastend area to Estevan coalfield), to as far north as Ellesmere Island. These floras reveal a variety of flowering plants, including members of the sycamore, birch and walnut families, but the most abundant fossil plants are the katsuras and the dawn redwood, now native only to southeastern Asia. In the mid-Paleogene period (56–34 million years ago) a brief climatic warming coincided with rapid diversification of flowering plants. Eocene fossils in British Columbia (Princeton, Kamloops and Smithers areas) reveal increasing numbers of modern plant families, with extinct species of birch, maple, beech, willow, chestnut, pine and fir. Exceptionally well-preserved fossil forests found on Axel Heiberg and Ellesmere islands in the Canadian Arctic illustrate clearly the contrast between modern Canadian vegetation and the floras of a much warmer past. These fossil forests, 40 to 60 million years old, consist of large stumps, many over 1 m in diameter, preserved where they grew, still rooted in ancient soil. Thick mats of leafy litter that formed the forest floor reveal the types of plants inhabiting the forests. Lush redwood and cypress swamps covered the lowlands, while the surrounding uplands were dominated by a mixed conifer and hardwood forest resembling that of modern eastern North America. Even accounting for continental drift, these forests grew well above the Arctic Circle, and bear witness to a time in Canada's past when a cold arctic climatic regime did not exist. Global cooling began toward the end of the Paleogene period, culminating in the glaciation of Canada about 2 million years ago. Late Paleogene fossil plants are uncommon in southern Canada, but in northern Canada, including Banks, Meighen and Ellesmere islands, peat beds containing spruce, birch, walnut, pine, larch and mosses reveal the evolution of Canada's boreal forests more than 20 million years ago. They also preserve a record of the final elimination of forests from Canada's North when continental ice sheets began to grow. The Pleistocene (about 2.58 million to 11,700 years ago) glaciation entirely altered the face of Canada, with the repeated advance and retreat of ice sheets as much as 3 km thick. During interglacial stages, forests returned to colonize the devastated landscape. The well-preserved remains of an interglacial flora are found in the clays exposed in the Don Valley brickyard of Toronto. The Don flora indicates that during past interglacial stages the climate of Canada has been much milder than that of the current interglacial stage. About 10,000 years ago the most recent ice advance ended. Global cooling and glaciation eliminated the old northern forests from Canada. Many plants found refuge in southeastern North America and China, where their descendants still live. Floras in these two areas are similar even today. Most modern Canadian plants are recent migrants from unglaciated areas and look very different from those of previous ages.